With our Grade I listed buildings, close proximity to Brighton, and the South Downs National Park on our doorstep, Sussex is an ideal place for a filming project. If you are looking to film on campus, see our permission and procedures below. We frequently receive requests from TV and film production companies who would like to use the location, our buildings, grounds, staff and students for film shoots. While we welcome requests, it is a busy working environment and these guidelines are designed to ensure that the University's interests are maintained and that its normal activities are not disrupted. 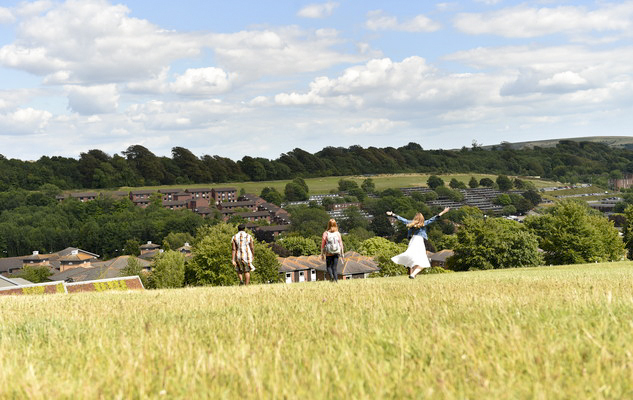 If you would like to film on campus contact press@sussex.ac.uk or call us on (+44) 01273 678888. Large-scale filming can only take place with our written permission and we must have at least six weeks notice of any proposed filming activity. Shorter notice periods will be considered at our discretion and will depend on the time and effort required to ensure the proposed filming meets our guidelines. If the proposed filming is likely to have a negative impact on the reputation of the University, permission will not be given. show us detailed plans for any pre-film recces – please note that all such recces must take place in the company of a University representative and only the specified locations agreed prior to arrival on site can be visited. No filming can take place without a signed contract of the terms agreed between the University and the production company. The contract will usually include a number of terms and conditions [PDF 82KB] (please pay particular attention to those concerning liability). If you want to visit us or have questions about where to film on campus, contact press@sussex.ac.uk. Any rental fee (for example porter hire, room bookings or University administration) for the use of the University’s property is at our discretion. The Filming Co-ordinator [FC] will agree this with the production company before filming commences. If you are a journalist and would like to film on campus as part of a media report, we will normally do our best to accommodate this without charge.